While most file explorer settings are managed via the File Management Preferences dialog (Menu edit -> Preferences, some can only be changed directly in the DConf database. 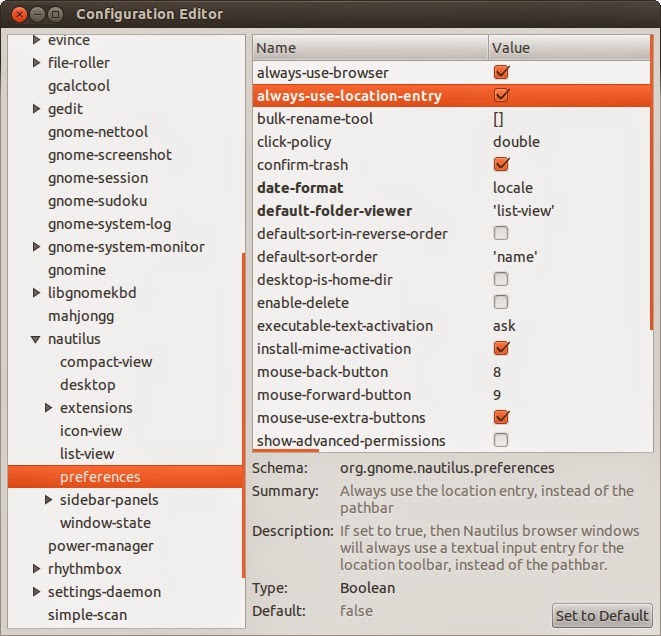 DConf is a simple key/value database to manage system settings as well as settings for tools and some applications. There's one file explorer setting in particular that not only is not accessible via the Preferences dialog, but is also set by default to a setting that most users probably want to change. By default, the file explorer displays the path to your current location as a series of buttons. While these buttons allow you to quickly jump up and down as many levels of the hierarchy as you like, they of course won't let you directly type in a directory location, nor can you paste a file path from the clipboard, or copy the path to your current directory to the clipboard. You might therefore prefer the more traditional text box that allows you do exactly that. There you have it; the directory location input control just like you remember it from the operating system that shall not be named.